1) What is a Boa Constrictor Imperator? The B. constrictor imperator, or the commonly known Boa Constrictor, is a species that belongs to the family Boidae which comprises several other species of Boa Constrictors. In Latin, imperator means "commander," hence, B. Constrictor Imperators are Snakes that command attention! Boa Constrictors live up to an average of 20-35 years old. Like all reptiles, Boa Constrictors are ectothermic, which means they rely on external resources to maintain their body temperatures (mammals are endothermic). Because Boa Constrictor Imperators are also tropical, their natural habitat is in the warm climates of Central America and northern South America. The Boa Constrictor Snakes I live and work with live in an enriched environment with proper temperatures and humidity for their health and comfort. 2) Are Boa Constrictors venomous? No. Boa Constrictors constrict the blood flow of their prey, leading to a circulatory arrest, which is a much quicker death than suffocation (asphyxiation). "Researches have demonstrated for the first time that constrictor snakes kill by stopping the flow of blood inside their prey. That approach is so efficient that animals don't survive long enough to die from asphyxiation--the method that most scientists thought was the correct "cause of death" in constricted prey. Stopping the flow of blood means no oxygen can be delivered to tissue" (Arielle Duhaime-Ross, 2015). 3) Does the Snake know I'm afraid? Yes. All Snakes smell your fear via our human hormones. But your fear does not trigger my commonly known Boas to react because I have entrained them to be comfortable with humans being a part of their known environment. In addition, I provide spacious socialization amongst my Boas, another form of enrichment that dissipates monotony and isolation. Boas living in the wild have no interest in coming into contact with us at all, because we are not part of their natural environment. They prefer to escape the situation safely, which may manifest as aggressiveness, potentially resulting in being bit or constricted by the Snake. Nevertheless, Snakes, like all of Nature's creatures, are powerful teachers for humanity. 4) Will a Boa Constrictor constrict me to death? No. My Snakes are not large enough to truly harm a human being. However, Boa Constrictors are heavy bodied reptiles, primarily made up of muscle, and will wrap tightly to support themselves. 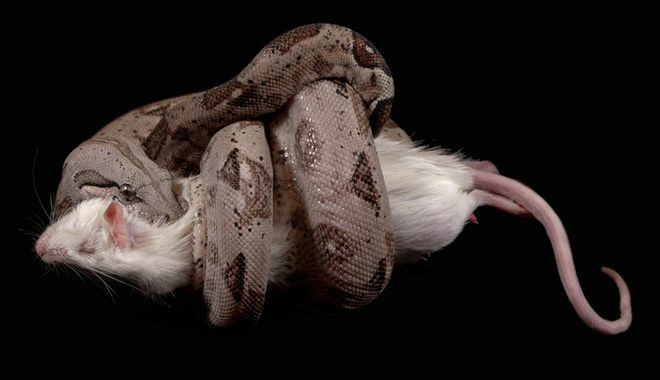 Ex: "A boa constricting a small rat is generating the kind of pressure that would stop the blood flow in your arm," says Scott Boback, Associate Professor of Biology at Dickinson College in Pennsylvania. 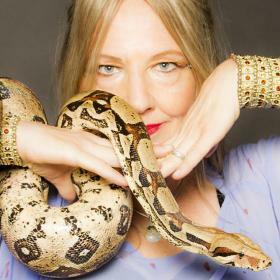 That said, it is the common Boa's exquisite sense of touch and the way it moves that feels so wonderful on our bodies. 5) Do Boa Constrictors have emotions? With only a brain stem, Boa Constrictors, along with all Snakes, lack the emotion and higher reasoning of primates. Whether captive bred or wild, Boa Constrictors always react instinctively to their environment. My Boas, socialized to people being non-threatening in their environment exhibit instincts of ease, curiosity, familiarity and other "personality traits" that can distinguish one from another. 6) Why do Boa Constrictors flick their tongue? Boas, like all Snakes, use their tongue to smell the odors that are around them. When a Snake flicks its tongue, it collects odor particles and delivers the scent particles to a patch of sensory cells called Jacobson's organ. The Jacobson's organ, which is located right above the nasal cavity, then communicates chemical messages to the brain stem that triggers different instincts such as reproduction and hunting. Without this ability, Snakes would not be able to survive. 7) How do Boa Constrictors shed their skin? 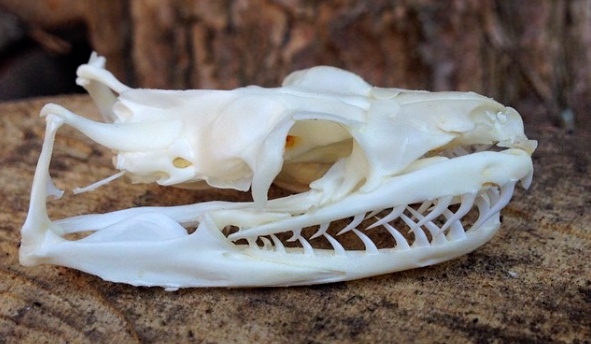 About every two months, Snakes go through a 2-1/2 week process of shedding their skin-- ecdysis. Like all Snakes, Boas shed their whole skins, including the clear spectacle of skin that covers their unblinking eyes. The first sign of ecdysis is the dulling of the ventral scales (belly scales). Liquid then starts to gather between the old skin over the eyecap and the new skin underneath, causing the Snake's eyes to become opaque and cloudy. (see photo on left) They don't enjoy being handled at all during this time. The Snake will shed shortly after the eyes become clear again. Sufficient humidity levels, between 60%-70%, allow for a more comfortable and easier shed for most Boas. 8) How do Boa Constrictors procreate? The Boa Constrictor is a seasonal breeder, usually between October-March in the Northeast USA. She emits a scent from the cloaca (vent) to attract a male. The female and male join together at the cloaca and the male internally fertilizes the female's eggs. Boa Constrictors are ovoviviparous, which means the embryos develop within the mother's body and the mother then bears live young. Boas are one of the few species of Snakes that give birth to live young rather than lay eggs. The neonates are born after 100-150 days of development. She may eat little or nothing while she is gravid (pregnant). The average litter contains about 25 Snakes, but a female can give birth from 10 to as many as 50 babies. Because females are able to store sperm, it is possible for a female who does not mate during a particular year to still become pregnant from the sperm she has stored from the previous year's mating. 9) What do Boa Constrictors eat? Boa Constrictors are ambush predators, which means they often lie around and wait for their pretty to come close enough to grab with their jaws and constrict. In the wild, Boas eat a variety of prey that includes lizards, birds, rodents, monkeys, and even wild pigs. Captive bred Boa Constrictors thrive better when fed thawed, previously frozen prey for health and safety reasons. Snakes, regardless of species, must always be fed separately from each other. Discover why so many people choose to Embrace a Force of Nature to Embody their Wild Divine Life!